Erica Bunker | DIY Style! 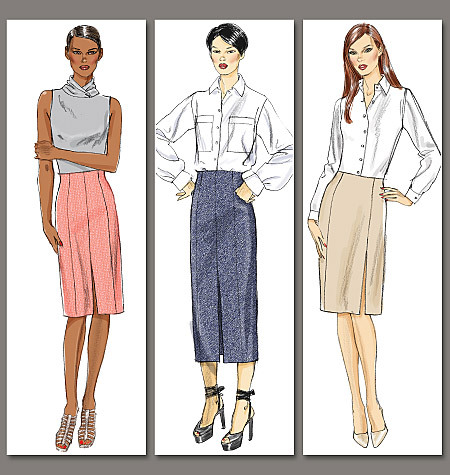 The Art of Cultivating a Stylish Wardrobe: New VOGUE Patterns! 1267 - Tom and Linda Platt. I love the asymmetrical hemline. Very similar to a knit RTW dress I already own. 1268 - Guy Laroche. I would love to make this in a faux suede as recommended. 8766 - Vogue Easy Options. I really love the strapless dress. 8772 - Vogue Easy Options. This is a great basic blouse pattern. The bow tie blouse is such a hot trend. 8773 - Vogue Easy Options. You can NEVER go wrong with a princess seam pencil skirt! 8774 - Jeans! I'll also be adding this one to my collection. Omg drooling over allllllll of them. Really like the blue dress 1267 and the jeans pattern I think I need that one. You have some great picks! I have to check out their preview. Erica What is your criteria for picking patterns - how do we pick the right ones? Wonderful choices! Can't wait to see your versions of these. Rachel, your question made me LOL! There's no "criteria"! ROFL I pick what I like. Looks like Vogue is making a return to the best of the 1970s. Have fun sewing these up! This is an especially good crop of patterns this time! I like several of the same ones that you do. I love your website! I happened upon it as I was researching patterns. I am a relatively new sewer and am taking a class to improve. Sewing my first blouse this week! Thanks for all of the fun inspiration! I can not wait to see watch your bow tie blouse looks like! I went to Italy this summer and wrote down a list of trends I saw and a few of these patterns are spot on! The pencil skirt with the spit up the left leg is so similar to this Versace dress I saw! Do you think these patterns will go on sale any time soon? LOVE the first one. I can just see my ample bottom making that back portion sway back and forth with intensity! LOL. I will surely get the button down shirt pattern. I went looking for one in the the Fall catalogues and it had pretty much disappeared. Vogue does it again. 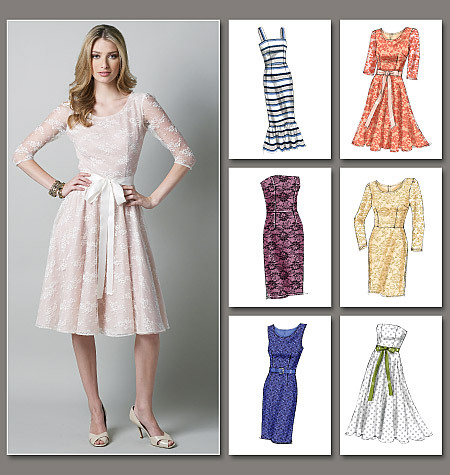 What a fun range of styles with something for everyone. I agree about the princess pencil skirt.